Being plump or on the healthy side is no shame at all. In fact, studies prove that people who are chubby tend to be more happy and content than the one who are skinny. We’re not stereotyping anyone here. Nor do we want to poke you lovelies to begin a cat fight. We’re here to do what we do best. Give you the most helpful advice when gloomy clouds of wedding crises dawn on you. Today, we address the question that seems to bother all those beautiful girls who are currently facing a tough time avoiding those yummy donuts and opting healthy meals instead. Walking and running 2 km daily only to be taking a pit-stop at McDonalds on their way back home. Basically, you’re just doing all things possible to get in shape to look drop-dead gorgeous on the wedding day, but alas! Why take the difficult road, when you have such super tricks up your sleeves. Follow these tips on lehenga designs for healthy brides and you can thanks us later! 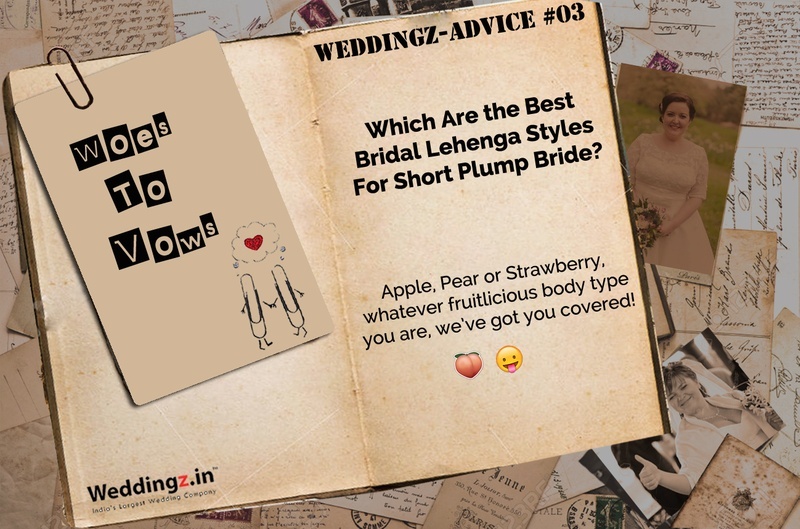 If you’re the no-diet lover kind of girl who loves the skin she in and is looking for simple hacks to don the perfect bridal attire. Read on. Think silk chiffon, georgette, sheer and net. Stay away from heavy materials like velvet and brocade, they just add extra kilos. Light, soft and flowing materials stay well on the body giving you a svelte, comfy and easy look. The more far away you stay from multi-colours the better. Keep a monochrome tone or just select a solid colour outfit this streamlines the look and doesn’t highlight your flaws. Go sheer mid-length and not short or puffy with your sleeves as these just highlight the extra flabs you have there. Also avoid heavy worked sleeves, keep it simple and let the fabric do the talking. Full collars or a high neck design accentuates the bust. If you’re heavy on the top choose a low neck-line, but avoid keeping it too deep just so it doesn’t look too vulgar. Choose smaller motifs, thinner belts and chic simple designs rather than big bold motifs and gap works, which highlight more spaces and attract attention to your flaws. Vertical designs give you a leaner look, as well as make you look tall. If you have heavy bottom, fish-cut bridal lehengas are not the best choice, select a high-waist A-line or full flare bridal lehenga that has a fuller ghera. Avoid a body hugging or fitting lehenga, this will just make movement too uncomfortable for you and accentuate the big butts (that don’t lie). Always wear clothes of your own size, not a size smaller or larger, but a perfect fit to look and feel gorgeous. Don’t even dare to go for those big bold and double aligned borders. Instead keep your dupatta and lehenga borders petty and stylish. Or opt for smaller motifs (which we mentioned earlier) and let them flow from top to bottom of your lehenga design. Avoid the lehenga trail. Yes, we know it’s in trend but this will only add a lot more weight to your attire and make you look bulkier. Avoid bridal lehenga cholis that fall loose on your waist this will only highlight your wider hips. Instead, go for a corset blouse, which is not too tight and fits well. How you drape your dupatta can also pretty much hide your flaws. A tight saree style dupatta draping works well to cover those little skin show and creates a neat look. Keep Your Standard and Heels High! Whoever told you to go on those crash diets right before your wedding, now you will have an answer to that! Once you have your sleek, lean and gorgeous bridal lehenga sorted team it up with pretty high heels and stay confident. Have any such related concerns or great hacks and suggestions to share? Let us know in the comments section below.